Update: Chen's Village closed Dec 28, 2018. 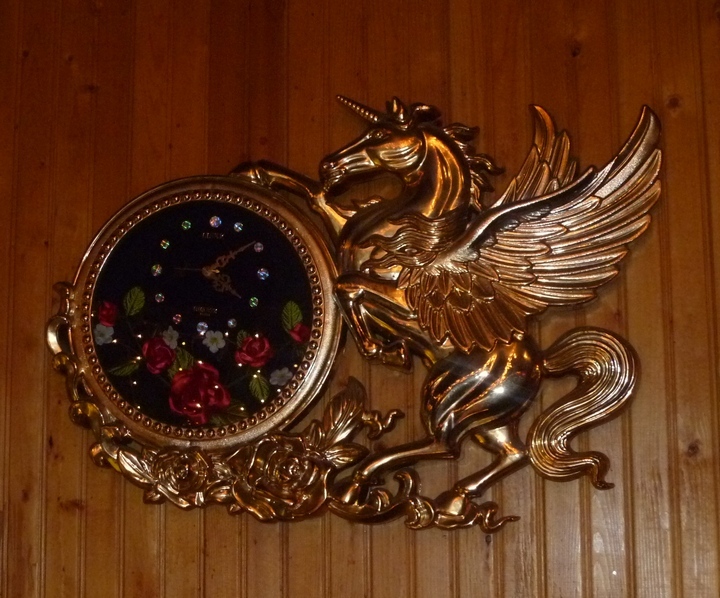 This is a classic old American Chinese place with a lounge attached. The lounge portion is integrated into the mirrored wall restaurant slightly more here than the typical darkened room in the back or side of the Chinese place. Before it became Chen's in 2005, this was the Lee Chee Garden, and before that it hosted a tiki bar. It was the Tiki Hut -- with "exotic beverages" served in the Shell Room lounge -- by 1962 and into the 70s (at one point also know as "Hope's Hut"). 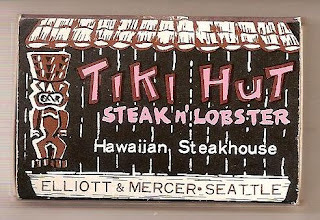 In the 80s it was the Blue Hawaiian Restaurant (still featuring the Shell Room) until becomeing Lee Chee in the late 80s. 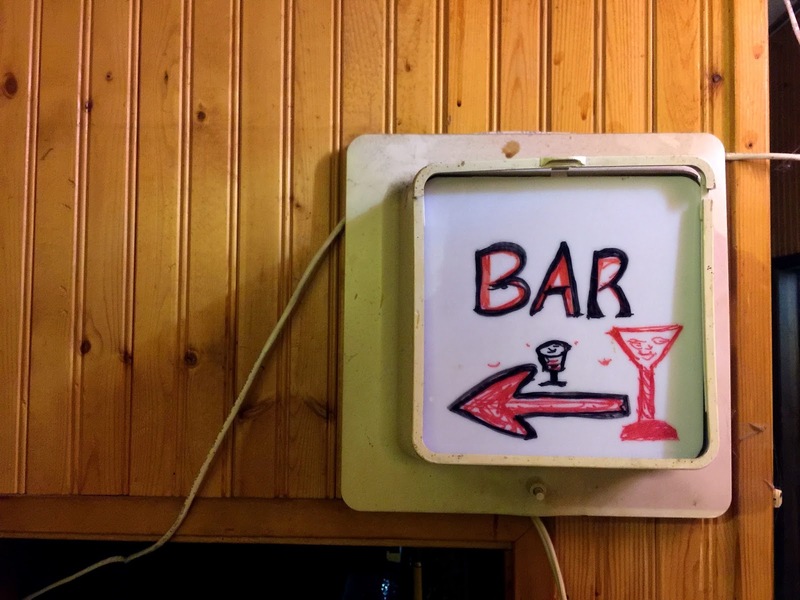 Rick Anderson writes of more recent days, "The bar tends to attract cops, editors, and other riffraff." But the only riffraff in the whole place on the Sunday afternoon we dropped in were ourselves. 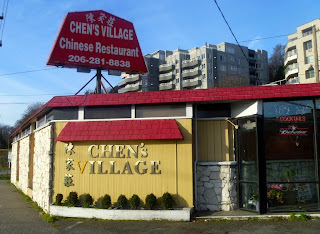 It serves pretty much the type of Chinese food and cocktails that you would expect. Update: Around 2015 I started working in a space just a couple blocks from Chen's. 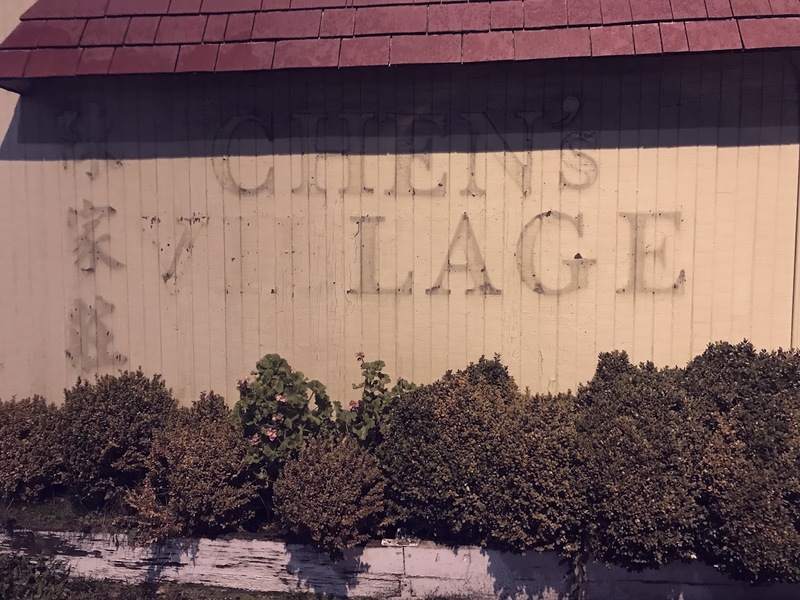 Since the photo here was taken, the I and the L had also fallen off the front facade, and hence it was referred to as what sounded like "Chen's Lodge." A few years later, more letters were missing, and I resolved to liberate one of them for myself and the office within the next few days. I was too late though -- two days later 100% of the characters out front, including the numbers of the address, were all gone. This wasn't entirely unexpected -- Chen's had been literally falling apart for several years. In addition to the letters on the facade, ceiling tiles, garden planter railings, the clock in the bar, and other various parts of the premises were all missing pieces, with no apparent effort to repair or even stem the tide of outflowing chunks of the restaurant. They also stopped investing in frivolities like heating the building, and on cold days the server would arrive at your table with a big puffy coat on underneath her apron. The food was still fine though, but most the orders now appeared to be take-out. 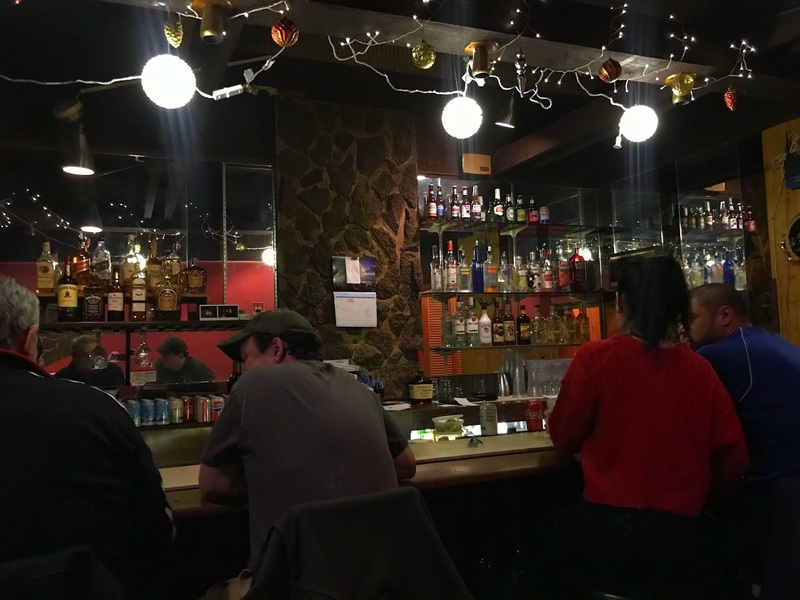 Update: The day after Christmas 2018, the "Vanishing Seattle" Facebook group, and perhaps other outlets, began to spread the news that Chen's would be closing for good that Friday. 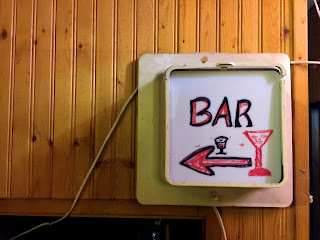 We stopped in for a nightcap, joining a few regulars who were grumpy that they couldn't get their customary seat at the bar. "No, I'm not scooting," one said, when a friend tried to join the couple to his right. This was the same fellow who told the person next to him earlier that he didn't know the price of vodka, because "I don't drink vodka -- I'm not a white woman on a diet." In between these exchanges, with "Jeopardy" on the television, they argued about the Punic wars and Greek islands. Scuttlebutt has it that the building is not, as one would suspect, due to be razed soon. 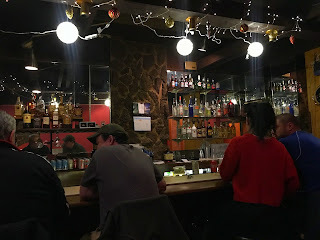 "Apparently it’s not being demo’d - the lease has been taken over by a local chef & it’ll be turned into a commercial kitchen" (Vanishing Seattle). It's an oddly shaped space in an oddly placed point in time and location, as the massive tide of development driving by Amazon et. al. just a mile or so to the east has yet to really roll up the narrow shelf of "Interbay," stretching from downtown to Ballard between Elliot Bay and Queen Anne hill. One hopes that the new management makes better progress on remodeling than the lingering mess that used to be The Shanty Cafe just up the street.